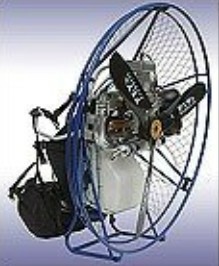 The Gold is a paramotor suitable for pilot weight from 130 lb. to 440 lbs. Selling since 2001. Simonini Mini 2 Plus (G24) engine of 28 HP 200 cc. with electric starter, power ignition, airbox, chromed tune pipe exhaust with an extra muffler (silencer), 3 piece dismountable cage and wooden propeller. Two sizes available.